Over many years a friend and I have accumulated quite a sizeable collection of motor racing photography. It ranges in date from 1902-2002, and as that comprised a century’s coverage of this most majestic sport we have restricted it to that period. We knew we wanted to recreate a workable, usable pit block which would present the same general shape, and capture the same general character, of the late-period Goodwood pits – but we were all well aware that a faithful reproduction of what had been there ‘in period’ simply would not cut the mustard by 1990s/21st Century standards. So whatever was built had to be stronger, brighter, more practical, better in every way – while somehow keeping the faith. 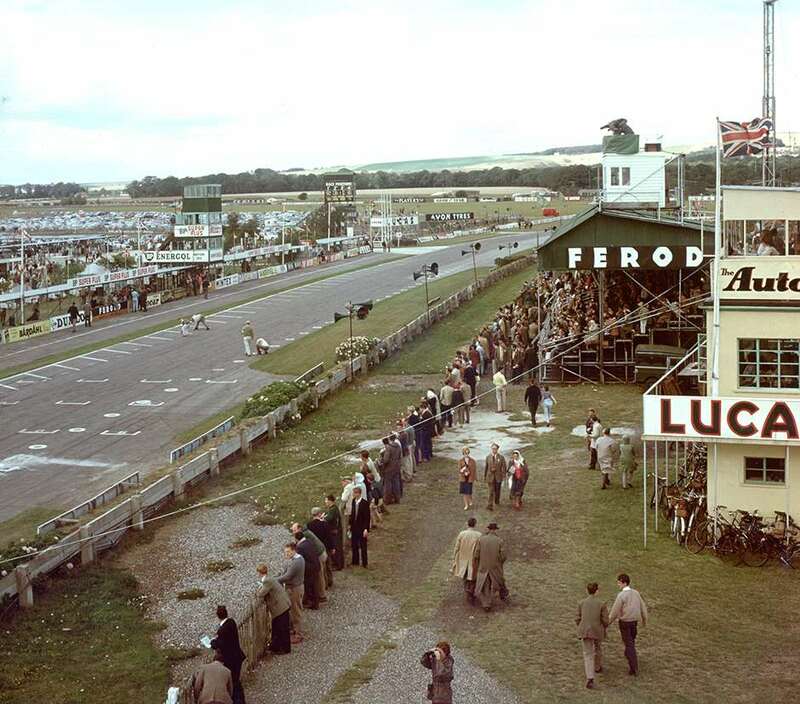 Here’s a wonderful reference photo I also found which was taken, we think, immediately before the 1962 RAC Tourist Trophy race at the Motor Circuit. It is incredibly rare. One has to think oneself into the mindset of a professional 1960s motor racing photographer. Very few publishing customers then had any colour capability. So there would probably be no end customer to buy the shot. So why bother to shoot it? The answer could only be genuine interest on behalf of the snapper behind that 2¼-inch square-format camera – probably a Rolleiflex – but whether that interest was really in recording what the BARC officials down there were doing, or how this latest colour film in this particular camera might resolve the scene, we shall never know. I always encourage enthusiasts not just to look at these old photos… but to look ‘into’ them. There is a difference, and just as with one of the old-time Giles, Thelwell or some Brockbank cartoons, I promise that the more you look – the more you will see. There are the Duke’s guests in the control tower on the right, commentators above – see the thermos flasks on that worktop? There’s the BBC TV camera position cantilevered onto the ridge of the main grandstand, the ‘Grandstand’ programme commentators in the white-painted box perched in between. The safety-zone separation between Freddie March’s cast-concrete crash barriers – those which inspired Fred Francis’s clip-on plastic facsimiles for his pioneering Scalextric racing sets – is amply illustrated here, and then there are those so nostalgic starting-grid markings – just savour them today – 4-by-3-by-4, no namby-pamby 2-by-2 in those days (and no chance for superstars to weave madly off the startline). The painted circles specify where the drivers must stand for the TT race’s run-and-jump Le Mans-type start. The diagonal lines on the far side denote the echelon rank for the start. The grass median strip comprises the protective pit barrier (!). And then there is a spidery scaffold work of the pit block itself, with the tower that used to creak and sway in a high wind, and the paddock beyond with its roofed-over stalls. Times gone by… now recalled and celebrated by every year’s Revival Meeting. This year the Revival will pay tribute to Bruce McLaren – more details can be found here.